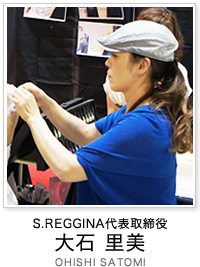 Produced the original brand “S.REGGINA”for the beauty products. Concept is “Beauty and Elegance”. Started to sell the Eyelash Extension. Introduced by the very popular fashion magazine “Ray”. Introduced by another popular fashion magazine “Betty”. Joined “Beauty World Japan Tokyo 2012”and exhibited. Developed the original body jewelry products, brand-new in the industry.Interviewed by the US press. Participated in “Shanghai Gift Show 2012”and exhibited. Joined “Tokyo Nail Expo 2012”and exhibited. Produced a glitter painting in a beauty art exhibition sponsored by some large companies. Took part in the biggest and best-known beauty trade fair “Beauty World Japan Tokyo 2013”and exhibited. Projected and held a body jewelry contest in Tokyo Big Sight. Demonstrated a body jewelry painting in the nail art & eyelash extension contest held in Wenzhou, which was a live program aired nationwide in China. Started the promotional activities of body jewelry in Korea. Joined “Tokyo Nail Expo 2013”and exhibited. Participated in “Beijing BEAUTY SHOW 2013”and exhibited. Joined"Beauty World Japan 2014"and exhibited. Joined “Cosmoprof Asia 2014”in Hong Kong and exhibited. Joined" Tokyo Nail Expo 2014" and exhibited. Joined"Beauty World Japan 2015"and exhibited. Joined “Cosmoprof Asia 2015”in Hong Kong and exhibited. Joined "Canton Beauty Expo 2016"and exhibited. Copyright © S.REGGINA. All Rights Reserved.